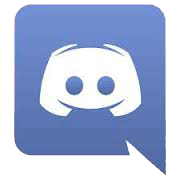 This is a guide to the Cartel Market and its associated reputation. You can view items available on the Cartel Market on the main menu under Cartel Market, Items or items available from the Cartel Market reputation vendors under Vendors, Both, Reputation. There is also a guide to the Cartel Bazzar Vendors. The Cartel Market is SWTOR’s in-game shop for cosmetic armor, weapons, mounts, pets, decorations, unlocks, consumables, and other miscellaneous items. The armor and weapons do not have stats associated with them. They are shells that you must modify with AMEs obtained from crafting, trading commendations, or extracting from other armor/weapons. (There are a few older sets that have stats and a level requirement and are sold directly on the Cartel Market.) The Cartel Market is not pay-to-win. All items are convenience or cosmetic only. 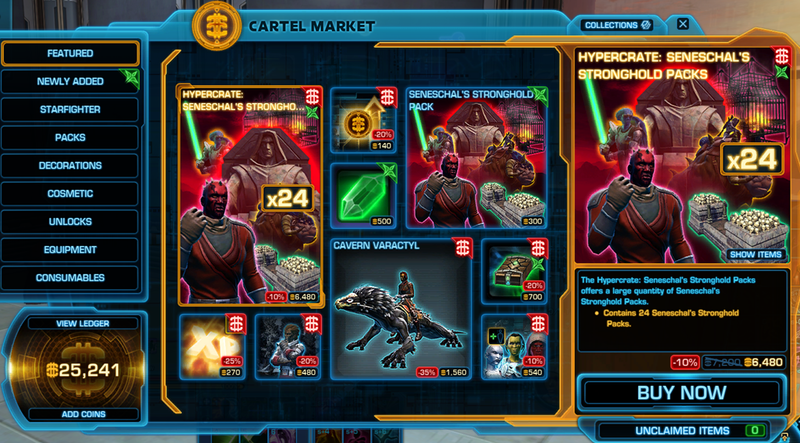 You can access the Cartel Market by clicking on the Cartel Coin icon located next to the menu bar. New items or those on sale are usually posted under Featured and are the first things you will see. To purchase items in the Cartel Market, you must buy Cartel Coins with actual currency. You can do this on the SWTOR website or, if you activate this feature, through the Cartel Market in-game by clicking “Add Coins”. You can earn Cartel Coins from being subscribed to SWTOR, using an authenticator, or by referring people to the game. If you are not already a subscriber, once you purchase your first Cartel Coins your account goes from free-to-play to preferred access. Cartel Coin cards are also available from some physical stores (Best Buy, Game Stop, Target, Walmart, etc.) and some online stores (Amazon, Origin). These cards contain a code for an in-game pet. These pets are phased out and new ones brought out from time to time. 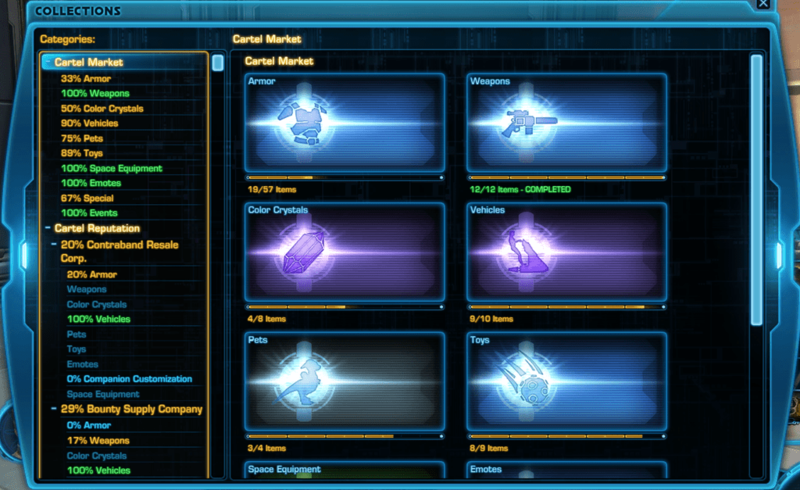 Cartel Market items are Bind on Equip (BoE) and can be sold on the Galactic Trade Network (GTN). Items purchased directly from the Cartel Market are available for a fixed price (frequently discounted). Some items are only available for a limited time (usually associated with a seasonal or in-game event). You can find out which items are available and the current cost by checking SWTORCartel. Authorizations are for F2P and preferred access players to lift restrictions not placed on subscribers. Unlocks allow players to unlock various items including slots, species, etc. You can view the items available in each shipment of Cartel Packs on the main menu under Cartel Market, Items or by clicking the link in this table. Bundles are essentially Packs, but always contain the exact same items and are only sold on the Cartel Market. Dye Module Kits contain two random dyes. They decided not to continue offering new dye kits and all new dyes available from the Cartel Market are offered in the Cartel Packs or straight from the market. They do occasionally bring back the Dye Modules Kits for sale on the Cartel Market, but they contain the same dyes as the original kits. Grand Packs contain only the type of item indicated in the pack title. These were items originally sold on the Cartel Market or available in Cartel Packs. For armor sets, it contains the entire set rather than the individual pieces of upper, lower, and supplementary packs available from the Cartel Packs. For a short time, rarity (bronze, silver, gold) packs were also available, but those were discontinued. The rarity packs contained the item indicated in the title, but only of one rarity. For instance, the Gold Armor Pack contained one random gold rarity armor set. Grand Chance Cubes replaced bronze rarity items in Cartel Packs with the second half of the Alliance Packs. These contain one random item or armor set of any rarity from any Cartel Pack, Cartel reputation item, or the Cartel Market. Some items from in-game vendors (Cartel Bazaar and Strongholds and Crews Skills section of Fleet) also sell items that require Cartel Market Certificates. These certificates were rare drops from Contraband through Explorer Packs. They are also extremely rare drops from the Contraband Slot Machine. This is a decoration available from the Acolyte’s Shadow Pack that uses Contraband Cartel Chips sold by Feulsia Stato (Decoration Merchant) for 750 credits. Felusia Stato is a decoration available for your stronghold or is found in the Strongholds and Crew Skills section of Fleet. Collections is a list of all of the Cartel Market items (along with other items available as rewards or gifts). This window allows you to purchase an account-wide unlock for most of the items with Cartel Coins. You can find the Collections window at the bottom left of your inventory or the top right of the Cartel Market. To unlock an item in Collections, you must first have equipped that item on one of your characters. NOTE: For armor sets, you must equip every piece of the set before you can unlock it. Starting with the Contraband Packs and ending with Explorer Packs, you could get Reputation Trophies and Cartel Market Certificates in the packs. Each group of packs (not including the Nightlife Packs) offered Reputation Trophies for a different faction. Once you obtain a certain amount of reputation with the faction, you can purchase items from the vendors located in the Cartel Bazaar on Fleet. Many of these items require Cartel Market Certificates and credits to purchase. Cartel Market Certificates are also used to purchase decorations from the Cartel Certificate and Personnel Vendor located in the Strongholds & Crew Skill section of Fleet. The Reputation Trophies are Bind on Pickup (BoP), so cannot be traded. You can view the reputation requirements and items available on the vendors on the Reputation vendor page. When Cartel Reputation was removed with 4.0, the vendors were consolidated and a few items were removed. They are only available from Grand Chance Cubes now.